Want to be notified of new releases in cardstack/cardboard? yarn start-prereqs will bind the PostgreSQL running in the Docker container to port 5432 which is the standard Postgres port. That might conflict with a local PostgreSQL you might have running, which would actually be used by the Cardstack hub in that case as opposed to the one running in the Docker container. The HUB_ENVIRONMENT environment variable is used to tell the Cardstack hub which environment it is running within. The possible values are development, test, and production. Generally the development environment is used for doing development on your local machine. The test environment is used for running the automated tests. The production environment is used for running a hosted application. If this environment variable is not specified, then the HUB_ENVIRONMENT=development is assumed. Use the environment variable GIT_REPO to specify the git data source SSH URL. Note that this is only used when HUB_ENVIRONMENT=production is also specified. If this variable is not used, then the ephemeral data source will be used instead. Use the environment variable GIT_PRIVATE_KEY to specify the private key for the SSH user used in the GIT_REPO environment variable. Note that this value will have newlines within it. Please see https://github.com/cardstack/cardstack/blob/master/packages/git/README.md for more details around specifying this environment variable. Use the environment variable GIT_BRANCH_PREFIX when you wish to use a branch other than master for your git data source. The value of GIT_BRANCH_PREFIX will be prepended to the string master when deriving the name of the branch to use for reading and writing documents to the git data source. Use the environment variable S3_IMAGE_BUCKET to specify the name of the S3 bucket to store image binary data. Use the environment variable S3_IMAGE_UPLOAD_ACCESS_KEY_ID to specify the AWS access key that can be used to write into the configured S3 bucket for image binary data. Use the environment variable S3_IMAGE_UPLOAD_SECRET_ACCESS_KEY to specify the AWS secret key that can be used to write into the configured S3 bucket for image binary data. The standard Postgres environment variables PGHOST, PGPORT, PGUSER, PGPASSWORD, etc are supported. You can control the postgres instance that the Cardstack hub uses by setting these environment variables. The Cardstack Hub can connected to many different types of data sources. Some data sources are read-only (like the Ethereum data source, Crypto Compare data source, and the asset history data sources in the Card Folio project https://github.com/cardstack/portfolio) and others are writable for holding content types that are controlled by the hub, including articles and "boards" (groups of articles) that are used in this project. The way we have arranged our writable data sources for the Card Board project is to use an "ephemeral" data source when the Card Board application is running with HUB_ENVIRONMENT=development environment variable and to use a git data source when the Portfolio application is running with the HUB_ENVIRONMENT=production environment variable. By default, cardstack applications run with the HUB_ENVIRONMENT=development environment variable. The ephemeral data source is a hub data source that is most often used for testing or for running in a local development environment. This data source persists documents only for as long as the cardstack hub backend is running. When the cardstack hub backend is restarted, the documents contained in the ephemeral datastore is erased--hence the term "ephemeral". By default this is the data source that the Portfolio application uses when run in your local development environment, as it requires no special setup to use, and it resets to its initial state when you restart the hub (which makes it wonderful for testing). The ephemeral data source uses what we call "seeds" to initialize its initial state. It is these seeds that we use for setting up the initial articles, boards, and images in the local development environment. 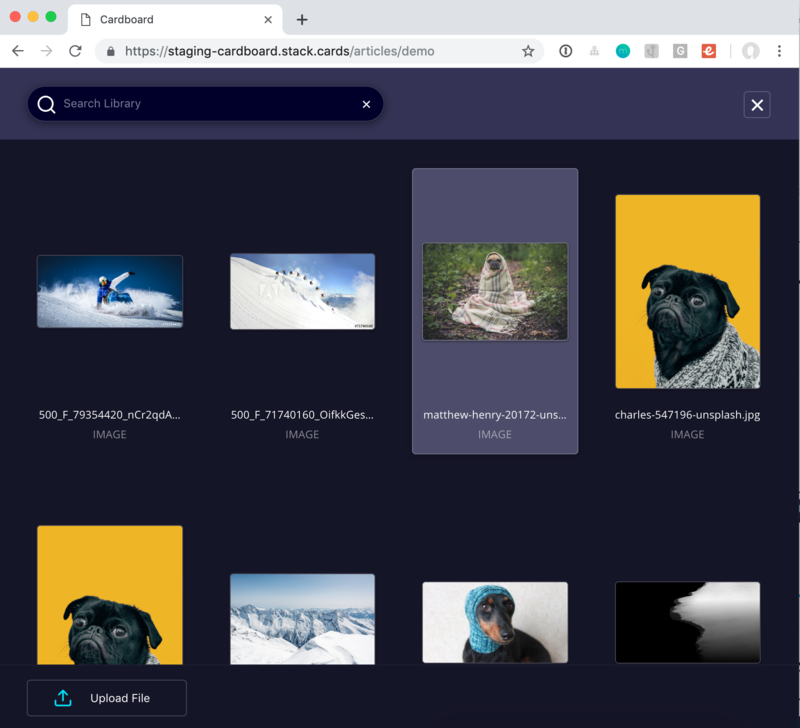 The cardstack hub can handle binary blob files like images as well. 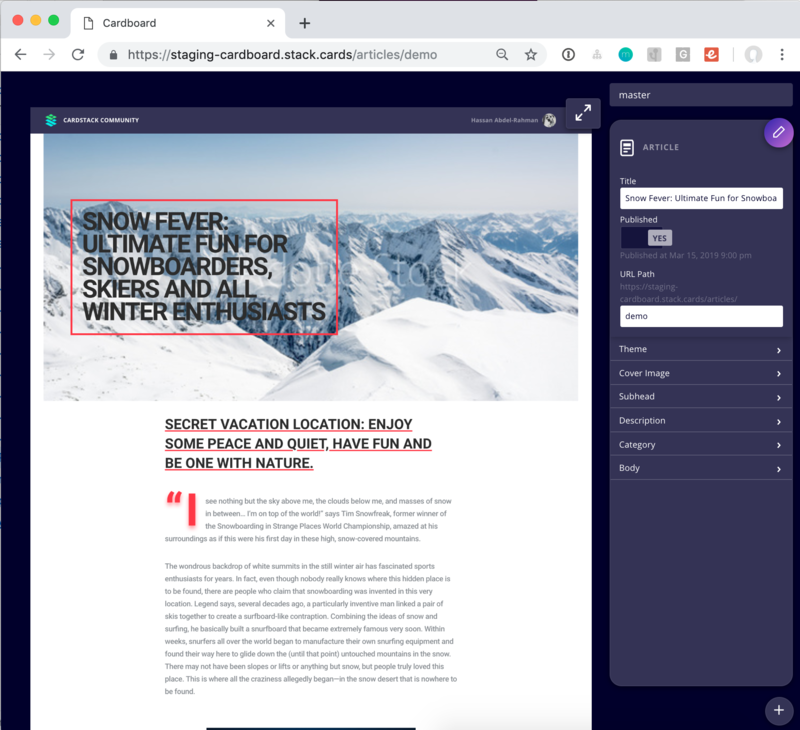 When the cardstack hub is running in a local development environment, the binary images are stored in the ephemeral datasource, which allows for very simple setup and automated testing. When the cardstack hub is running in production mode, we use S3 as the datasource for binary files. The cardboard/cardstack/seeds/ folder holds modules whose evaluated module.exports are arrays of resources that are created as "seed" models when the Cardstack hub starts up for the ephemeral data source (when HUB_ENVIRONMENT=development environment variable is set). The cardboard/cardstack/sample-data.js contains the articles and "community" board (that lives at the index route) that are used in the development environment. We construct the models using a @cardstack/test-support/jsonapi-factory factory. The factory ensures that the underlying JSON:API structures are valid, do not contain cycles, and are emitted in a manner where the resource relationships are created in the correct order (as a Directed Acyclic Graph) so that resources that are dependencies for other resources are created first. The JSONAPIFactory adheres precisely to the JSON:API specification https://jsonapi.org/. The factory allows us to create resources that have attributes and relationships as defined in the specification. Additionally, the module that loads the image seeds is located at cardboard/cardstack/load-images.js, which is responsible for seeding all the binary data. The git data source is used when the HUB_ENVIRONMENT=production environment variable is set. In this scenario, the hub will write and read boards, articles, image metadata, themes, and category content types from the configured git repository. This repository can be a git repository that is hosted by GitHub or another git hosting provider, or a git repository that is hosted privately in the VPC that the Cardstack Hub is running from. To use a git data source, in addition to specifying the HUB_ENVIRONMENT=production environment variable, you will also need to specify the SSH URL of the git repo in the GIT_REPO environment var (e.g. GIT_REPO=git@github.com:cardstack/cardboard-data.git), and you will need to specify the private key for the user in the SSH URL of the git repo in the GIT_PRIVATE_KEY environment variable. (Due to the need to preserve line breaks in the private key, this may be a little tricky, see https://github.com/cardstack/cardstack/blob/master/packages/git/README.md for more details). The hub will use the master branch of the specified repo to read and write content. If you want to have the hub use a different branch, you can specify GIT_BRANCH_PREFIX environment variable for a prefix to apply to the master branch, e.g. GIT_BRANCH_PREFIX=staging- will cause the hub to read and write content to the staging-master branch instead. Documents that reside in a git data source leverage the JSON:API specification (https://jsonapi.org), live in the master branch of the repository (which can be changed using the GIT_BRANCH_PREFIX environment variable), underneath within the contents/ folder. Within the contents/ folder is a folder for each content type that originates from the git data source. Within the content type folder each document's file name is the ID of the document (with a .json file extension). Each document's file contents is a JSON:API document without the type and id properties, as we derive the type and ID of the document from the folder and file name of the document. Testing needs the same prereqs as running. Note that currently bad things can happen the @cardstack/* dependencies get out of sync between the various cards. When upgrading @cardstack/* dependencies make sure to use yarn upgrade-interactive --latest --scope @cardstack (or whatever patten is appropriate) in order to upgrade all the @cardstack modules in lock step.